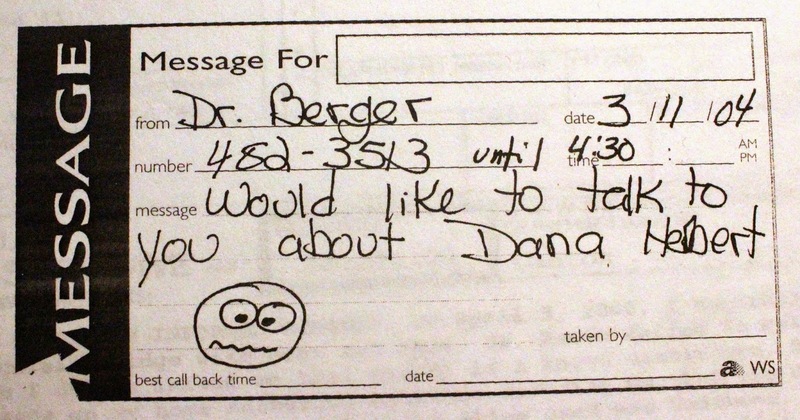 On March 2, 2000, I was solicited to the dental office of Theresa F. Keefe, DMD, (a.k.a. Dr. Tracey Keefe) because she wanted to pay for my decorative painting services in her house, which she owned with her husband, hematologist/oncologist Zia Rahman (St. Francis) by providing me with cosmetic dental care . . .
Now, you don't have to be a rocket scientist to see that there is something seriously wrong with this picture. 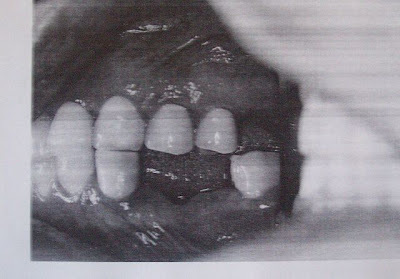 A case of oral non-Hodgkin's lymphoma presenting following a tooth extraction is reported. 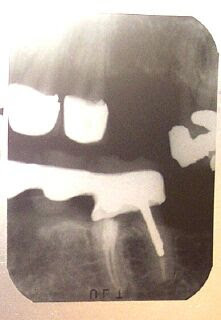 The clinical presentation was that of a periodontal lesion and an extraction socket that failed to heal. "Swelling, ulcer, or discomfort may be present in the region of the lymphoma, or it may mimic a periapical pathology or a benign condition." 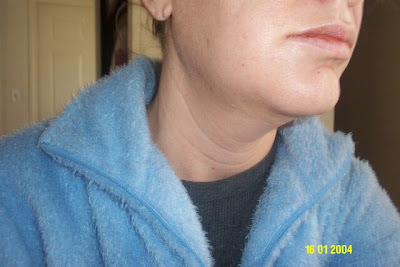 - Diffuse Large B-cell lymphoma of mandible: A case report. 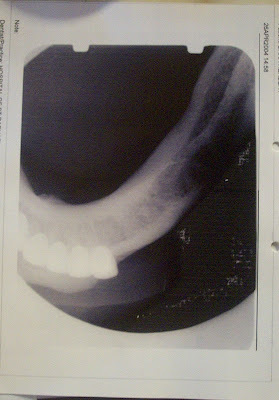 Unfortunately, I did not have access to this x-ray until October 25, 2002, or this photograph until August 24, 2004. 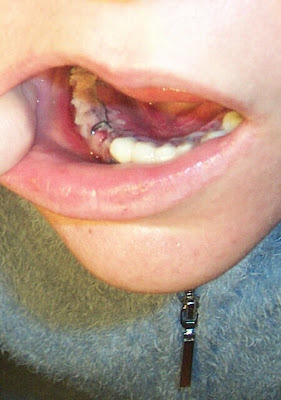 Had I known about this lesion in my jawbone, I would NEVER have allowed Dr. Keefe (who has post-graduate training in dental oncology and head and neck cancer and is also a Clinical Professor of Dentistry at UConn Hospital) to place a carcinogenic nickel-beryllium-aluminum post into tooth #30 and a cosmetic dental bridge over a potentially cancerous non-healing ulcer in my jawbone . . . .
Notice the osteoclerosis (seen in bone lymphoma) and the widening of the periodontal ligament space next to where her custom-designed nickel-beryllium core cuts into my jawbone? Both signs of cancer. 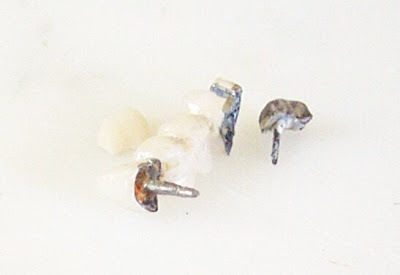 Beryllium has been banned from dentistry because it causes osteosarcoma, and there was even a lump of reactive bone (reactive fibrosis is seen in bone lymphoma) that grew around Dr. Keefe's post and core. 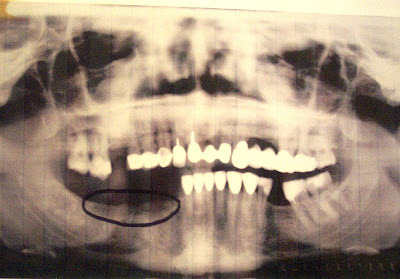 Also, the post in tooth #30 looks like it has caused the entire root to resorb and the adjacent bone to turn black. You would think that with all her post-graduate training in oncology (she is not incompetent, and her husband was her oncology professor), she'd be the first person to recognize the signs of cancer, and the last person to sell you a carcinogenic nickel-beryllium bridge . . . .
Nickel causes bone lymphoma, aka reticulum cell sarcoma, aka histiocytic lymphoma, a lymphoma of the connective tissue. 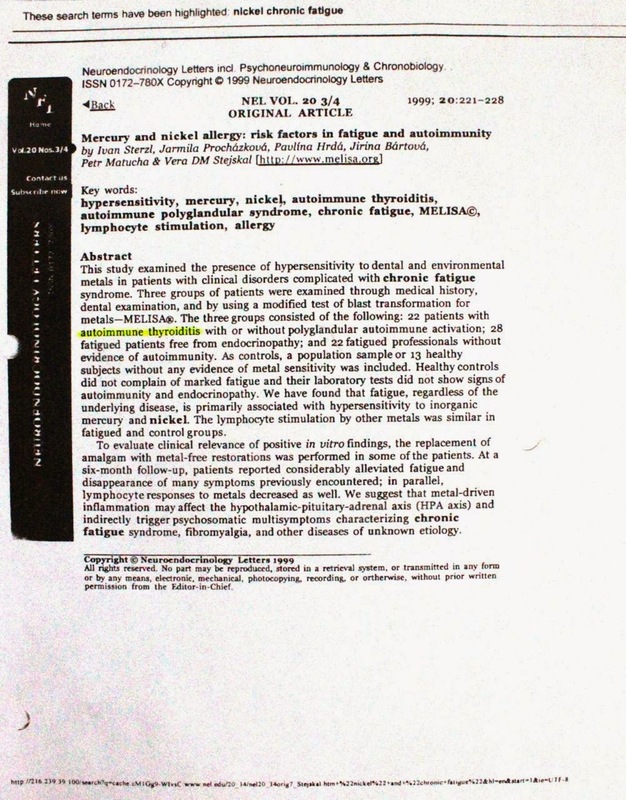 She agreed to meet me at her office on September 2, 2002 to discuss and then she very coldly refused to remove these allergens and carcinogens from my mouth even after I spent almost two hours in her office crying and begging her to remove it, unless I paid her another $3500 for a replacement bridge. I called the manufacturer of Unitbond, the metal used to fabricate my post and core, and they told me that Unitbond was contraindicated for use in posts and cores. 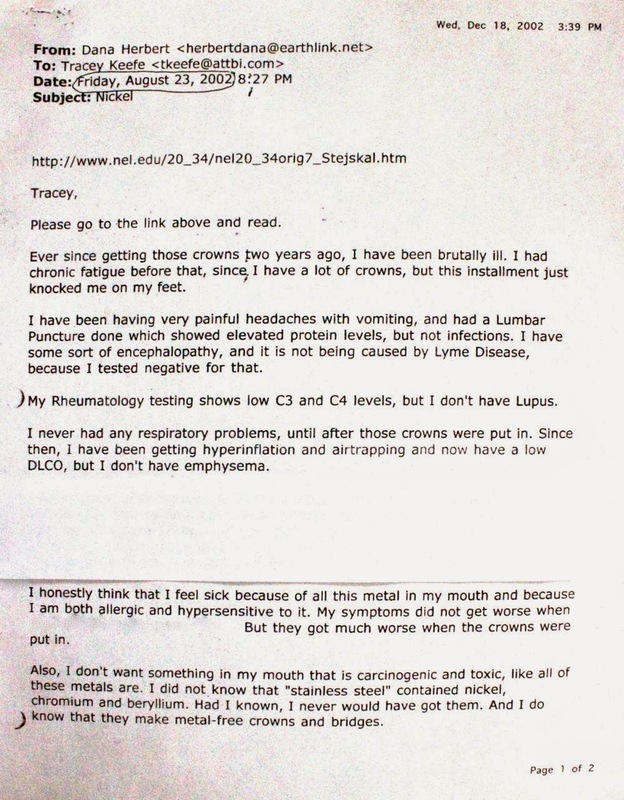 The MSDS for the 78% nickel alloy (Unitbond) used in my mouth by Dr. Keefe claimed that it was toxic and caused tumors and fatigue. It has been recently removed from the market. Still, Dr. Keefe refused to remove it. 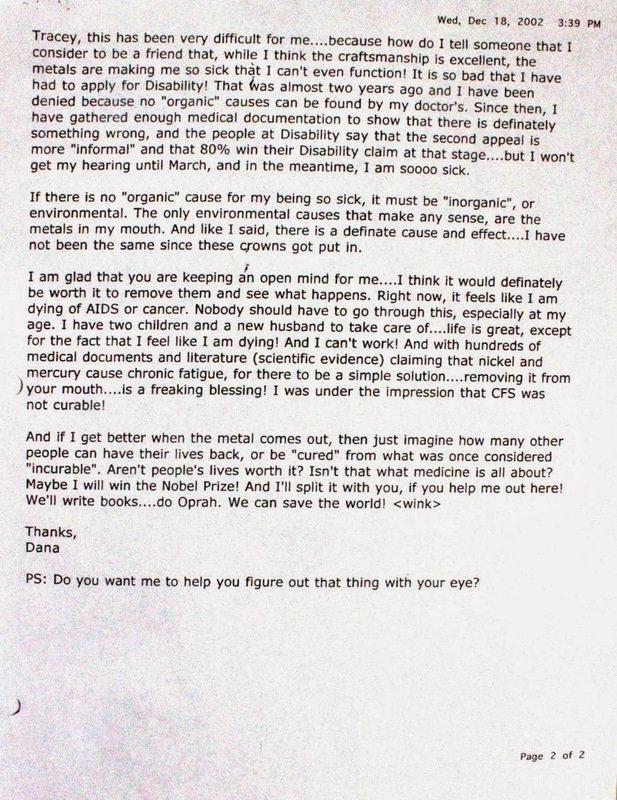 She told me that I would never be able to prove that dental metal allergies cause CFS or cancer, that no oral surgeon will ever biopsy my jawbone, and that I will never be able to prove I have cancer. So I filed a suit in small claims court to get my money back for the bridge, so that I could have another dentist replace it and to assert my rights as a dental consumer. However, she had her attorneys motion it over to the regular docket. 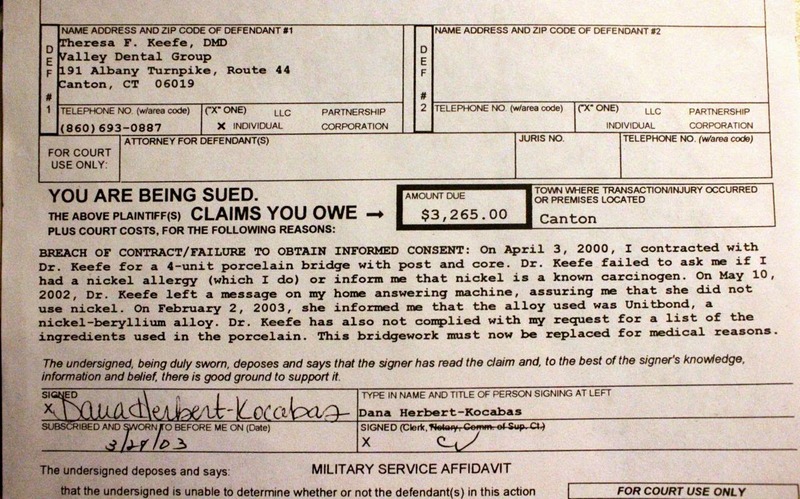 SMALL CLAIMS LAWSUIT transferred to regular docket by Dr. Keefe: Click here to see how difficult it is to get the carcinogens she places back out of your mouth. 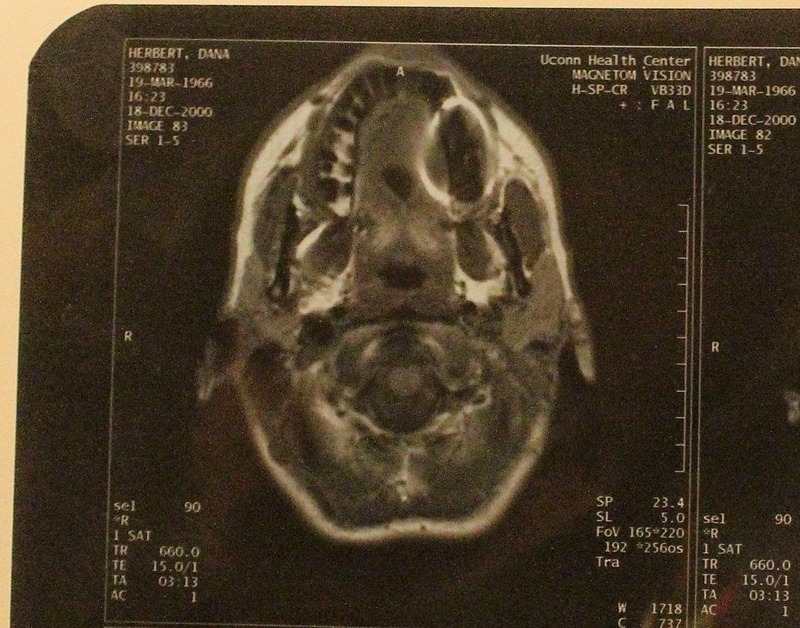 During discovery, Dr. Keefe has made it very clear that she thinks that I am delusional for believing that I have cancer in my jawbone and that nickel is a carcinogen. 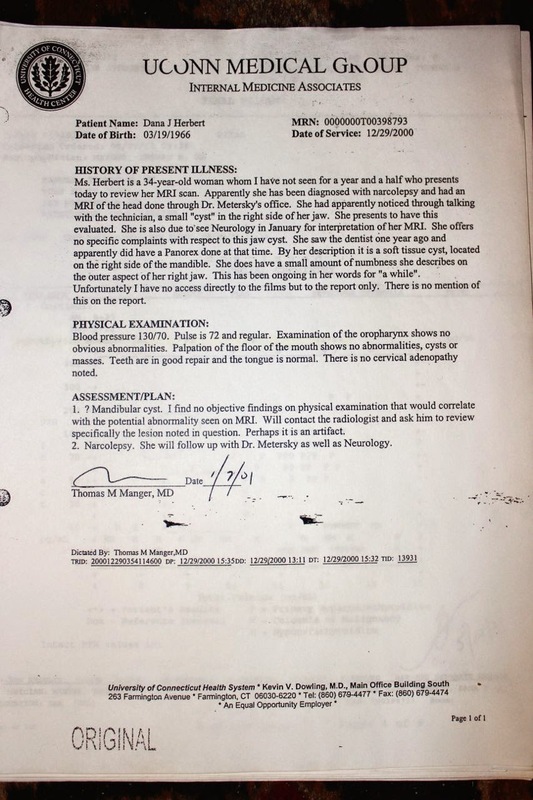 She also deposed my treating psychologist and tried to convince him that I was a delusional liar, that there were NO lesions in my jawbone, and warned him that he was about to testify against another "professional". During four 8-hour depositions at her attorney's office she would show up and glare at me with hatred the entire time. She never once showed any signs of remorse or empathy or apologized. So how do you recognize a sociopath if you happen to meet one in your daily life? Stout urges readers to practice what she calls "the rule of threes." One lie or broken promise or neglected responsibility may simply be a misunderstanding. Two may involve a serious mistake, but "three lies says you're dealing with a liar, and deceit is the linchpin of conscienceless behavior," Stout writes. "Do not give your money, your work, your secrets or your affection to a three-timer." (It had a loose post and core still attached, which means the bridge was broken). 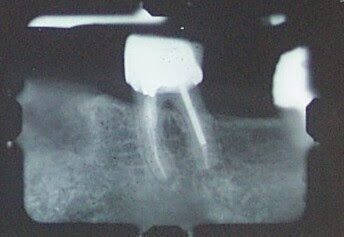 (Notice the two dark spots from toxic nickel leaching out due to root resorption. 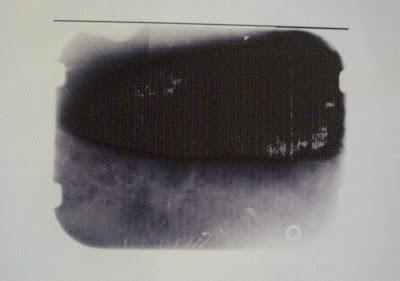 If I had not gotten that extremely toxic bridge out of my mouth, I don't think I'd be here today to tell my story . . . .
At the time, I did believe it was an "artifact" because I trusted Dr. Keefe. I hope you like the living room, dining room and 2-story foyer I painted for you Dr. Keefe. I worked really hard to make your home more beautiful and used only non-toxic materials. Had you not been happy, I would have painted it over, for free. Hi Dana, I just read most of your blog, thanks for posting all the great information. Did you ever get diagnosed with MDS?